I’ve been getting some great feedback on my “How to Find Paid Gigs” post. Thanks for reading it and for taking the time to comment. One suggestion I received via Facebook was to talk a bit about finding gigs other than bar/pub/restaurant gigs. There’s many ways to “gig for a living” so I’d like to include some options to play shows that don’t involved playing in bars for hammered patrons. “Freeebird!”. When it comes to trying to find paid gigs you have several options. I’ll cover a few different things here. If you think I’ve missed something then please free to comment below and leave your two cents! Busking: The feature photo for this blog post was taken in Aug 2015 in Edinburgh during the International Festival. It is a picture of the first time I busked, ever. 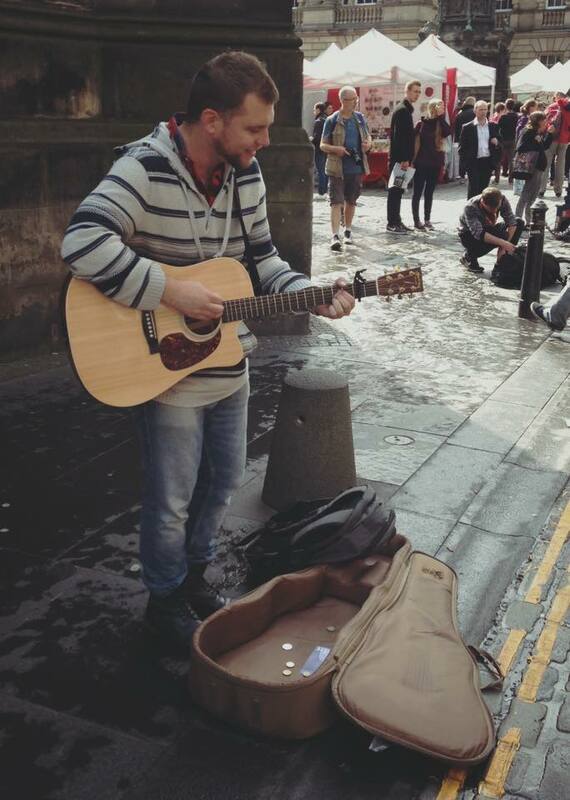 Busking may be viewed kind of negatively (by some) but as my time in Edinburgh during the Edinburgh International Festival has taught me-it doesn’t have to. I’ve busked before here and there and it is a great way to make some quick money. It’s not my method of choice for making a living but it has it’s merits. The secret to making the most of busking is to find a good location with lots of foot traffic being in a “touristy” part of town doesn’t hurt either. Check local laws regarding busking and amplification. Some places allow amps and others do not. Some cities also sell permits to busk so check with your city council to inquire about these (I know in Toronto you can apply for a busking permits to play in subway stations. If you have a good spot and everything is legal then I would say that the other secret to maximizing the potential of busking is to have CD’s available to sell, or a website containing your music that folks can purchase your music from. You can hand out business card with your website on it. You could also have a sign with your web address on it and a note “inviting people to take a picture with their phones”-to have your webpage and social media links saved in their phones. This is music and performing in it’s most raw form so it is really about the connections you can make with those listening to you. Many people will walk by as people’s lives are happening feverishly around us as we know. Some will stop though, to listen and take part in what you’re offering. Encouraging further connection through social media/CD sales really depends on how you work it. The most successful buskers I’ve seen know how to command a crowd and often say things like “Please everybody move forward, get nice and close here. I don’t want you to be standing close to the traffic, let’s make a circle”. Another thing to keep in mind is the length you play for. If you find a killer spot and other buskers gather around waiting for their turn it’s generally understood that you’ll play for 45 minutes to an hour. After that you go look for another place to play. That’s how it was in Edinburgh. If you can get one person to stop and pay attention odds are more will follow as it is basic human psychology to not want to be the first to commit to leaving the “comfort zone”. Farmer’s markets and other types of marketplaces are a great opportunity to play music for people, make some money, and make some great connections. In Edinburgh I would often play at the outdoor markets on weekends-the Leith Market on Saturdays and Sundays at Stockbridge. I love playing the markets as it is a vibrant setting where you meet tons of people. I love being outside and being around people. I made friends with amazing people from different walks of life by performing at the market. I also love the energy and atmosphere of vendors interacting with shoppers looking for great food, products, and services. It’s different from a typical bar gig as there isn’t the pressure to play songs you may not like to play. It’s always wise to play mostly upbeat music, but you do have a lot more leeway here than when performing in a pub or restaurant. Another difference between bar gigs and playing at markets is that typically the markets don’t pay you a fee to play. If you get into this scene and manage to get a fee then good for you, but I always played for tips. It is essentially busking, but on steroids. You play for tips but you are the one scheduled to be there, almost like a featured artist. I prefer this to street busking as it is seen as a bit more “legit” to people. This helps sell more music and to convert more social media followers. I became a marketplace performer by visiting the market and asking for the manager. I chatted with her about the idea of having me come and play some guitar to enhance the atmosphere further and she loved the idea. It was an easy sell as I did not require a fee and would play for people’s generosity. Hint: After playing a few songs and getting a few tips I always thank everyone “for their generosity” in tipping me. I don’t know if my gratitude is endearing to them or if I make them feel bad (not my intent lol) but it always works like a charm. I’ll say this a few times throughout the day as there’s a high turnover of people at the market, but try not to overuse it! Oh and the food at the market is my guilty pleasure and often the vendors are very generous are give you stuff at a discount or free even. Mmmmm paella! 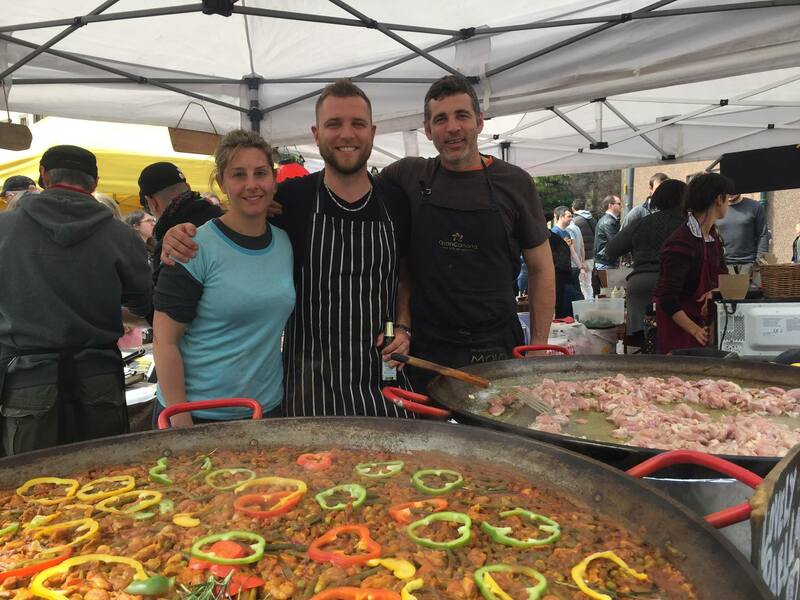 Learning to make Spanish Paella with my friends over at the Paella tent in the Grassmarket Saturday Market in Edinburgh, 2016. Great people, great food, great fun! Go visit you local farmer’s markets, flea markets, etc and inquire about providing live music for tips. It’s a great way to make money during the day while meeting amazing people, enjoying great food, and supporting locals venders! You can contact caterers and offer you musical services. Many caterers have clients that are interested in live music so you are an asset to a caterer. You can allow a caterer to easily reply “I have a guy/girl for that” any time they have a potential client asking about music. From employee appreciation days for office workers, to Christmas parties, art gallery events, weddings, and tons of other possible events, this is one great way to find work that doesn’t require you to play in bars. Handing out business cards at live shows (in bars, marketplaces, wherever really) is a great way to book private parties (such as birthdays, weddings, summer BBQ parties, holiday parties, etc). Playing private parties feels very rewarding and flattering as the client chose you specifically for their special event. If you’re friendly, work hard, and care about your clients and their event than you will often be handing out more business cards at these events as well. By nurturing these values it’s just a matter of time until you are receiving frequent calls out of the blue to play more private parties! I’ve never really gone this route but I know a few performers that have. There are agencies that book performers to play on cruise ships and in hotels/casinos (domestically or abroad). I Googled “talent bookings for cruises and hotels” and found a bunch of companies in the industry. Always make sure to do a bit of research on any companies you’re thinking of working with (there are scams out there so beware). This type of overseas work can be great though depending on your circumstances. If you like to travel, are single, and want to make money and have very little living costs, this opportunity might be right for you. From what I’ve hear you generally play 6 days a week so this is a great way to really improve your playing. From what I’ve heard there’s no rent to pay or food costs and you can make around $3,500.00 a month. Speak with musicians in your music scene (At open mics or on Facebook local music scene pages) and ask for some advice. Visit your city hall/council to inquire about city organized events/festivals. Perhaps the town is planning a Rib Fest in the near future and could use a band. Most towns and cities have a department of recreation and culture. You can offer your services for consideration for upcoming municipal events. Besides the things I’ve mentioned in this post, you can use your imagination and entrepreneurial flare to think of other places to perform. Schools often put on concerts, why not call around to the different school boards to find out more? Some daycare centres offer musical stimulation as part of the package to make their daycare centre more alluring to parents. Call around and offer this type of service to day care centres. You can advertise to groups of parents to hire you to play music for all of their children for an hour. Do you see where I’m going with this? This is why we must be music entrepreneurs. It’s not enough to take the mould of the status quo and apply it to our lives as musicians. You are far better off always trying to expand the services you offer and the connections you are making with people in different industries. The “box” of playing pub gigs exists and you can play within and outside the rules of this “box”. You’re the boss, do what works for you! Good luck applying these methods to your life. Be in touch on the “TME Community” page to let us know how everything is going for you. Like bar gigs, success here depends on hustling hard and being active in finding work. With everything mentioned above you should be able to find some paying work! I want to finish with this last thought. Music is a powerful thing. It creates memories, happiness, and has even shown powers of healing. If you are in a position where you’re working hard at it and making good money, please consider the notion of playing music for the less fortunate. Old person’s homes and hospitals are always looking for volunteers to give the gift of music. I know not everyone is in a position to do this. So as to set the example and encourage you, I am enrolling to perform in an old age home and I will write a post to talk about the experience at some point down the road. I hope you’ve enjoyed this post and if you’ve found it useful than would you do me a huge favour and PLEASE share it! Also, please sign up for my mailing list to receive notices when I upload new content. I really want you to succeed with music and enjoy what you do! Cheers. Will you learn songs from yonder for them?